Quality Home Locator has been buying and selling properties in the Decatur, IL area for over 10 years. Our website has achieved high rankings within the major search engines and our properties consistently rent within the first few weeks after being listed on our website. We have a vast database of local users interested in rentals within this area to draw from. This also includes students interested in Millikin University Housing. We also have a trained staff that not only can show your house, but can provide any needed repair or maintenance. Screening and showing your home as well as providing quality service after the contract has been signed is what keeps tenants happy and renting from you. Some of the towns we service are Decatur, Forsyth, Mt Zion, Moweaqua, Long Creek and Maroa in the Illinois area. If your properties location is not listed don't worry, just contact us. We cover the entire area and will be happy to help. Make recommendations concerning any repair or cosmetic work that may need to be done in order to maximize your revenue potential. Provide data on rental rates in the area and help you to determine the optimal rent for your property. 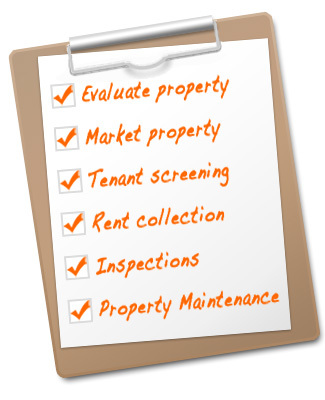 Perform bi-monthly inspections looking for repair needs, safety hazards, code violations, lease violations, etc. Providing tax deductions/recommendations related to thier rental property. If you have a property you would like to have us manage feel free to contact us.